Sterling silver Vintage London bus charm. An open top London bus from the early 20th century, quite similar to the earlier horse drawn buses. 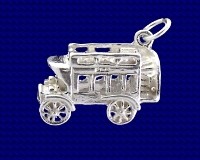 Craftsman made Sterling silver Vintage Bus charm.